It’s a new year, and 2018 marks the 50th anniversary of the start of the original North American Soccer League, typically remembered (albeit not entirely correctly) as the first attempt at establishing major league professional soccer in the United States. Even casual fans are acquainted with the league’s great successes in the late 1970s, when storied players like Pele, Johan Cruyff, Franz Beckenbauer, George Best, and Eusebio came to grace American (and mostly AstroTurf) fields. Sadly, those fans are also probably acquainted with the league’s ignominious collapse in a sea of red ink after the 1984 season. Unfortunately for Philadelphia soccer fans, one team did not survive the merger…at least, not directly. So now, 50 years after their demise, let’s take time to Meet the (Philadelphia) Spartans. In the mid-1960s, professional sports were booming in America. Major league baseball expanded (largely to head off the challenge of a third major league), and rival leagues popped up in football and basketball, with a new hockey league just on the horizon. Against this backdrop, a number of businessmen decided they want to glom on to the next big thing: professional soccer. So big was the interest that two leagues arrived in 1967. However, the interests of the owners in each were largely the same: not just to get in on the ground floor of what might be America’s next big sport but, more immediately, to fill cavernous stadiums that sat idle for large chunks of the summer. As a result, both leagues found teams owned by the baseball and/or football teams in their respective cities. As Philadelphia was one of the most populous cities in the United States at the time, a major sports league not having a team in the City of Brotherly Love was unthinkable. There was a small problem, however: neither the Eagles nor the Phillies (nor any other local group) had any interest in owning a franchise. In the case of the Eagles’ lack of interest, there were two main factors: as the gridiron team did not own the stadium where it played home games (Franklin Field), it was not troubled by the overhead costs of the stadium sitting vacant. Also, it should be remembered that two Eagles owners–Jerry Wolman and Ed Snider–were in the middle of acquiring a new NHL franchise for the city, and were not that eager to take on the added expense of pro soccer ownership. Nevertheless, Philadelphia had to have a team–particularly in the NPSL, which managed to score a 10-year television contract with CBS. Fortunately, ownership of a Philadelphia franchise arrived…and from a most unlikely source. From across the state, Art Rooney–owner of the Pittsburgh Steelers–stepped up to acquire a franchise for Philadelphia. While a fixture in Pittsburgh, Rooney was not without a connection to Philadelphia, having completed his college education at Temple University on an athletic scholarship. He also saw the soccer franchise as an opportunity to introduce his twin sons, John and Pat, to sports ownership. The Temple connection also came in handy when it came time to find a home ground for the new team. 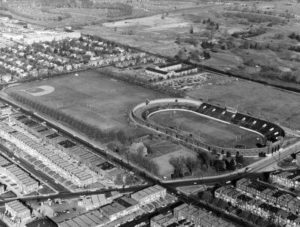 The Philadelphia Spartans would play matches at Temple Stadium, a ground situated in the West Oak Lane neighborhood of the city seating approximately 20,000 people. Erected in 1928, Temple Stadium was horseshoe-shaped, with the open end facing west-northwest, and built into a natural bowl. The NPSL was unique in the annals of American pro sport in that it was an outlaw league–it was not sanctioned by the United States Soccer Football Association or FIFA. As a result, any player participating in the NPSL risked being banned from other domestic leagues, and disqualified from participating on behalf of his country’s team in international tournaments. Notwithstanding this handicap, Hungarian coach John Szep was able to put together a talented roster. Perhaps because of the handicap, however, he managed to draw that roster from not less than 11 countries. From his home country, he tapped forward Tibor Szalay and midfielder Laszlo Kaszas; from Austria came goalkeeper Gernot Fradyl, while the other goalkeeper–Ernesto Lopera–hailed from Colombia. A handful of naturalized Americans also dotted the roster, including 1966 American Soccer League MVP and former Temple star Walt Chyzowych. The core of the team came from Argentina and England. The former country provided the core of the Spartans back line, led by Ruben “The Hatchet” Navarro, veteran of 209 matches with Independiente and capped two times by his home country. Leading the English contingent was defender John Best, midfielder Roy Turner, and forward Peter Short. 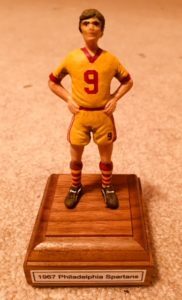 Sporting rather attractive gold-and-burgundy kits, the Spartans were ready to face all comers in the 1967 season. While newcomers to the sport, the Rooneys were nevertheless enthusiastic about its professional prospects. “Dad thinks this league has a better chance than the NFL did in 1933,” offered club president John Rooney. The Spartans opened their season at home, defeating the Toronto Falcons 2-nil behind a Peter Short brace before 14,163 fans on April 16–the NPSL’s largest opening day turnout. The healthy opening day crowd proved to be an anomaly, however, as only 4,815 came to Temple Stadium a week later to watch a goalless draw against the Baltimore Bays. The Spartans never broke five figures the rest of the season, coming closest when 8,009 attended the last home game of the season on August 23 against the powerful Oakland Clippers; those who did attend witnessed an exciting 2-1 win for the home side behind goals from Szalay and West German import Dietricht Albrecht. For the season, the Spartans averaged 5,261 per game, just ahead of the league average of 4,799. Indeed, this match should have been a preview of the NPSL final, which would find the winner of the Western Division (Oakland) pitted against the winner of the Eastern Division in a home-and-home, total goals final. At the end of the season, Philadelphia and Baltimore shared identical 14-9-9 records, with both teams scoring 53 goals and finishing 1-1-2 in head-to-head competition. However, as Philadelphia had conceded fewer goals, under normal rules it would have been declared the division winner. The NPSL was far from normal, however. In an attempt to encourage offensive play, the league adopted a 6 points for a win/3 points for a draw/1 bonus point per goal scored up to 3 per match system. Although each team had scored 53 goals, the Spartans had featured in a few blowouts–in particular, a 7-2 rout of Toronto on May 28–which meant that the club did not get a bonus point for every goal scored. Ultimately, because of bonus points, Baltimore finished with 162 points to Philadelphia’s 157, and went on to lose to Oakland in the final. The Spartans still had a chance at hardware, though. Following the final was the Commissioner’s Cup, which found the two second place teams in each division facing each other, with the winner facing Oakland. Philadelphia was blanked 1-nil by the St. Louis Stars, however, who then went on to get crushed by Oakland, 6-3, giving the Clippers a rather unique double. Philadelphia fans could at least take comfort in the fact that Navarro was voted a first team all-star and earned MVP honors from The Sporting News–even while taking over the coaching reins during the season ( and playing only 14 of the team’s 32 matches. Argentinian forward Orlando Garro scored 11 goals, and Fradyl finished fourth in the league in goals against average with a 1.43 mark, and was tied for second in clean sheets with 7. After the 1967 season, an antitrust lawsuit filed by the NPSL against the USSFA and United Soccer Association–along with the fact that both leagues were hemorrhaging money–led to a merger creating the NASL. Unfortunately for Philadelphia fans, the Spartans would not be a part of the new league. 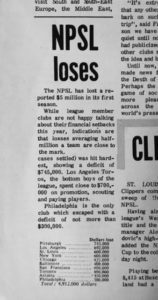 Despite the Spartans losing the least amount of money of all the NPSL sides (about $300,000; the league reported a loss of $5 million), Art Rooney decided that he no longer wanted to be bothered with pro soccer. The club lost money, and the Rooneys convened at the Roosevelt Hotel to discuss its future. Art and the twins, especially John, loved the sport. But, unlike football, where he had sustained losses for decades, Art was unwilling to subsidize the Spartans. He pushed to terminate involvement. “Let’s vote,” he demanded. “Let’s get this over with. We’ve got the votes.” Art, despite having become hard of hearing, caught Pat [Rooney] muttering, “Don’t be so sure.” His father snorted, “Listen, you, we’ve got the votes or you won’t have a vote.” The vote went Art’s way. With that, the Spartans were gone. Major league professional soccer did not return to Philadelphia until the arrival of the Atoms in 1973. Coincidentally, the NPSL’s Pittsburgh franchise also decided to fold up shop; as it was owned by the men behind the NHL’s new Pittsburgh franchise, the approximately $700,000 lost by the soccer team almost caused the Penguins to fold, as well. While the Spartans were gone, the spirit of the team lived on in 1968–in no small part because of unique issues raised by the mini-Soccer War of 1967. Specifically, while the United Soccer Association ran a season in 1967, they did so by importing entire foreign teams to represent the individual cities; in other words, the USA final between Los Angeles Wolves and Washington Whips was actually contested by Wolverhampton Wanders and Aberdeen, respectively. As a result, while USA teams were part of the merger, they were behind their NPSL counterparts as far as player acquisition. Cleveland Stokers–who had been represented by Stoke City during the 1967 season–found an easy solution: acquire players from the best NPSL team not joining the combined circuit. Among the Stokers moving west to Cleveland were Navarro, Short, Best, and Roy Turner. The latter three would continue to have lengthy NASL careers, with John Best figuring prominently in Philadelphia soccer history when his own goal in the 1973 NASL final allowed the Atoms to beat Dallas Tornado, 2-nil. Best was also the first coach in Seattle Sounders history. 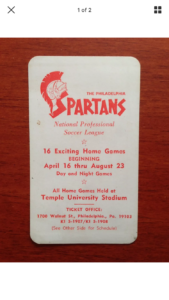 The Spartans name returned in 1969, when it was used by Philadelphia’s new American Soccer League franchise. It operated for four years, finishing in first place in 1972 but then dissolving after the Atoms arrived the next year. Thanks Steve. More great work from you. Enjoyed it. I really enjoy reading US soccer (hi)stories! Fine background to Philly soccer. Hope Union fans will read this. Yes, I remember playing for the Spartans of the American soccer league while attending U of P dental school. Coach Walter Bahr was as nice a man as you could find. We even played River Plate of Argentina in an exhibition with a very nice crowd.